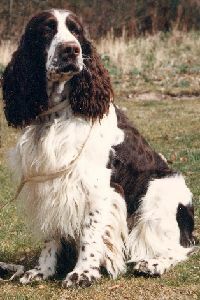 Sally was my first springer. She came to me at a year old, and we were inseperable from then on. Everywhere I went she went. She followed behind the horses, went to the pub, but most of all liked to sit in the front seat of the MG Midget when the top was down. She loved her food, was a terrible thief, and stole many a persons lunch! She gave us Harriet and Butty, both experiences that we would not have wanted to miss. Jenna was Kevan's first dog. She was just the most obedient and clever dog - knowing more than we did then, she should have gone to Agility, or obedience training. 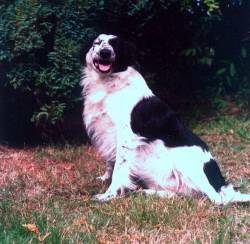 She was a Border Collie, and unusually, had spots on her white markings - she must have caught them off the Springers. She is fondly remembered, not least for telling us when the phone rang, and for her love of carrot's. Happy Harry - the bed's too big without you. Harriet our chef d'equipe, our time keeper, how we miss you. A wonderful Happy dog was Harry. She may not have been blessed with a working instinct, or indeed perfect conformation, but Harriet was loved wherever she went. A lay back attitude to life, that would sometimes surprise you with a flash of super energy. But woe betide if supper or walk was five minutes late. Harry would let you know. She loved mashed potato, and After Eight Mints. We can face neither now. watching the world go by. It was almost as if he was an ornament! which many of the passers by thought that he was until he decided to bark! Tishy Woo came to us from Jean Taylor. 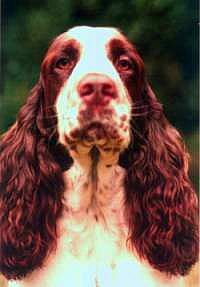 She was a really pretty dog, feminine and dainty, with superb movement. Her favourite thing in life was Ice Cream. She would do anything for ice cream, and I always referred to her as Mummy's little ice cream puppy. She was a good dog, loyal and faithful. 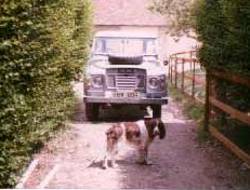 Tish had a successful showing career as a young dog, but most of all loved to spend time with me at the stables, where she would just follow me round all day, just doing what I did! Ah how short are the days! How soon the night overtakes us! Yet how grand is the winter! How spotless the snow is and perfect!